State Sen. Dave Hansen, D-Green Bay, speaks at Maps Madness: Voters vs. Politicians, a rally organized by the Wisconsin Fair Maps Coalition outside the Wisconsin state Capitol on March 7, 2018. The rally was an unsuccessful effort to convince legislators to hold a special session on a bill sponsored by Hansen calling for a nonpartisan redistricting process. Photo by Cameron Smith/Wisconsin Center for Investigative Journalism. No matter which way the U.S. Supreme Court decides, change could be coming to Wisconsin’s partisan system for redrawing electoral districts. In a decision that could come down any day, the nation’s highest court will decide a lawsuit challenging the U.S. District Court for the Western District of Wisconsin’s ruling that the 2011 redistricting was unconstitutional. Thus far, 39 of 72 Wisconsin counties have passed resolutions in support of a nonpartisan redistricting process at the urging of groups including the Fair Elections Project, a bipartisan group that supports litigation, legislation and public advocacy to stop partisan gerrymandering; and the Citizen Action Organizing Cooperative, a group associated with Citizen Action of Wisconsin in which members pay an organizer to work on changing the state’s redistricting process. Ultimately, these activists envision a system similar to one used by Iowa, where the nonpartisan Legislative Services Agency creates the new map every 10 years. Previous voting statistics are not considered, and the homes of legislators or members of Congress are not taken into account. The LSA uses population size as the primary determinant when considering how to redraw a district. The agency divides Iowa’s 99 counties into four congressional districts and 100 legislative districts. Appropriate shapes for districts include squares and rectangles. Transparency with the public is key to Iowa’s redistricting success. A temporary Redistricting Advisory Commission, created by the floor leaders of the General Assembly, holds three public hearings throughout the state after the first plan is released to lawmakers, allowing citizens to comment on the proposed districts. If the new map is voted down, the Legislative Services Agency can draw another and then another. If those maps are all rejected, then the Iowa Supreme Court will draw new maps. “In the four redistricting processes since the Iowa law took effect in 1981, the Iowa Legislature has always passed the nonpartisan maps created by the Legislative Services Bureau without ever going to a third vote,” according to Common Cause in Wisconsin. 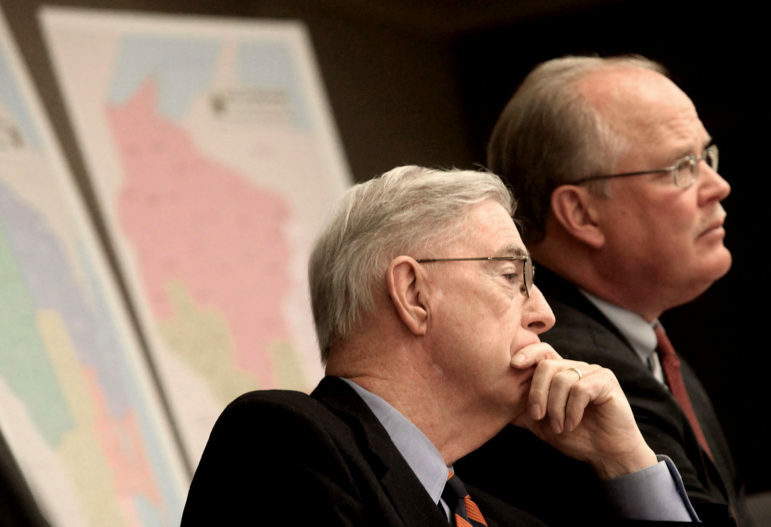 Then state senators Tim Cullen, D-Janesville, left, and Dale Schultz, R-Richland Center, hold an unofficial public hearing in 2014 addressing their proposal for nonpartisan redistricting at the Wisconsin state Capitol in Madison on Feb. 10, 2014. Republican leaders refused to hold an official hearing on the measure, which called for Wisconsin to adopt a nonpartisan redistricting model similar to that used by Iowa. Photo by John Hart / Wisconsin State Journal. While they were in the Wisconsin Legislature, Democratic state Sen. Tim Cullen and Republican state Sen. Dale Schultz tried to change the system from the inside. After the 2011 redistricting, the two authored bills calling for new maps to be sent to the court if they are voted down twice. But they never got a hearing. Schultz and Cullen are now co-chairmen of the Fair Elections Project Wisconsin campaign, which is dedicated to helping “end the partisan gridlock” by stopping gerrymandering. Democratic Sen. Dave Hansen of Green Bay believes Republicans and Democrats must come together and pass nonpartisan redistricting laws to give citizens fair, transparent and competitive elections. Last session, two new redistricting bills sponsored by Democrats, including Hansen, Assembly Bill 44 and Senate Bill 13, were proposed. They called for the Legislative Reference Bureau, a nonpartisan state agency, to draw district lines and for the establishment of a Redistricting Advisory Commission. Both died after not receiving a public hearing. 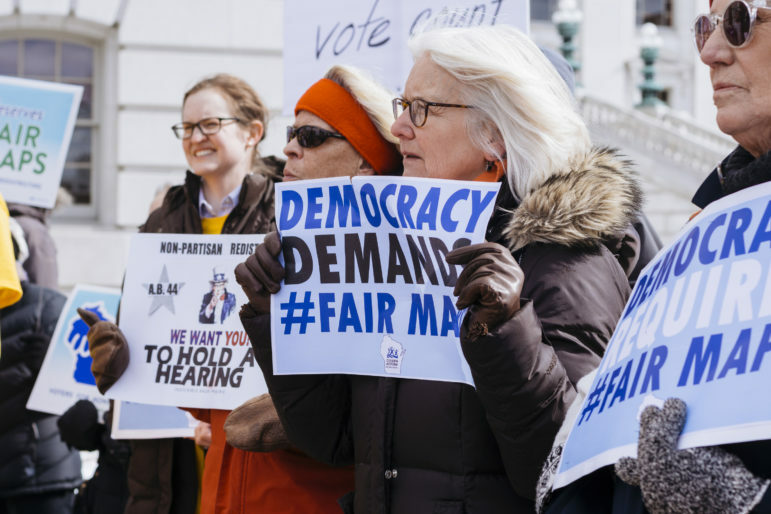 Wisconsin’s 2011 redistricting is under challenge in a U.S. Supreme Court case, which the plaintiffs argue discriminates against Democratic voters to create a persistent Republican majority in the Legislature. 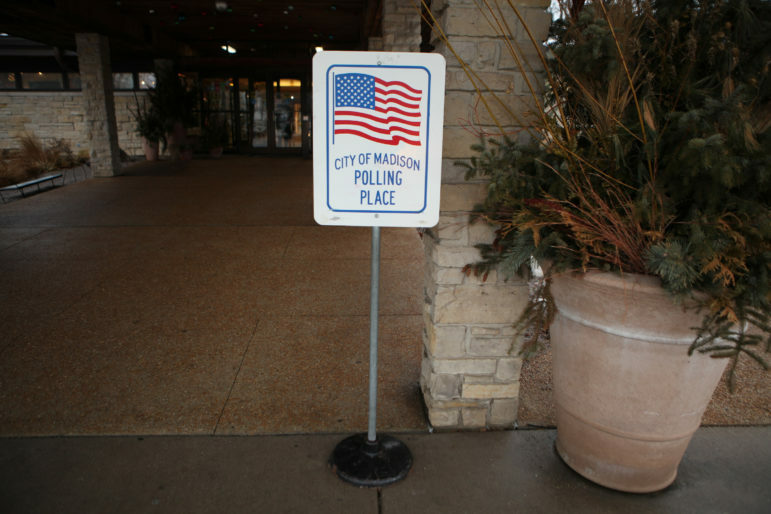 Here, a voting sign is seen at the polling place at Olbrich Gardens on Feb. 20, 2018, in Madison. Photo by Coburn Dukehart / Wisconsin Center for Investigative Journalism. Republican Rep. Kathleen Bernier of Chippewa Falls, chairwoman of the Committee on Campaigns and Elections, said she held an informational hearing on nonpartisan redistricting bills in 2013. She did not schedule a hearing for AB 44 because of the ongoing Supreme Court case, saying there was no need to preempt the court’s decision. Under the most recent bills, the Redistricting Advisory Commission would advise the nonpartisan reference bureau in the redistricting process, make copies of potential maps available to the public, hold three public hearings on the maps, and provide summaries of those hearings and the testimony involved to the LRB. If the high court upholds the redistricting, Republicans are unlikely to voluntarily junk a system that has worked so well for them. And it is worth restating that when Hansen’s party controlled the Legislature and governor’s office in 2009 and 2010, nonpartisan redistricting was not passed. Marla Stephens attend Maps Madness: Voters vs. 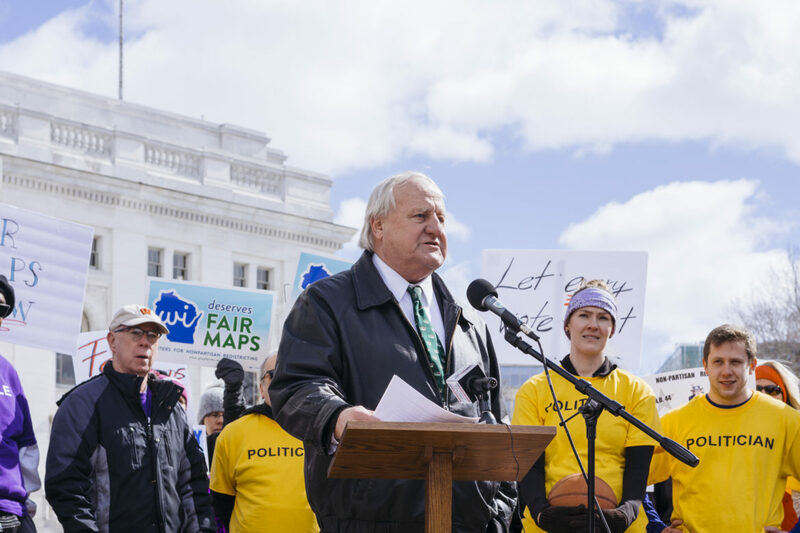 Politicians, a March 7, 2018 rally organized by the Wisconsin Fair Maps Coalition held outside the Wisconsin state Capitol. The rally was aimed at pressuring lawmakers to hold a special session to enact a nonpartisan redistricting system. Stephens, a former candidate for state Supreme Court justice, says she believes her vote has been diluted by redistricting in the Milwaukee area. Photo by Cameron Smith / Wisconsin Center for Investigative Journalism. “If you think just electing Dems is going to solve this problem, you’re wrong,” said Marla Stephens, a former state Supreme Court candidate who is pushing to end partisan redistricting. Hansen said he felt there was no need for a redistricting reform before the 2010 census because previous redistricting frequently fell to the courts due to a split Legislature or split power of state government. He said he plans to reintroduce his bill in the next session, no matter what the Supreme Court decides. “The people of this state deserve it, our democracy deserves it, and taking the politics out of redistricting reform is needed if we are to restore — and this is so important — the people’s faith in their government, and end the polarization we see every day in Madison and throughout the state,” Hansen said. Blue wave hits Wisconsin in November of 2018, Democrats win assembly, Senate and Governorship. Decide to scrap fairer redistricting and prefer controlling map. No one seems to care especially the media so long as Republicans have no power. Troll, you sound very passionate about fair redistricting. In this hyper-partisn country, its nice to find something that both I, a Democrat, and you, a Republican, are passionate about. I think we should all seek to capitalise on our common ground and push together as citizens for reform. Sorry libtards! The Supreme Court ruled today, libtards LOSE! Republicans WIN! Ha ha! Libtards don’t get or deserve voting rights, so go cry or leave Wisconsin. Republicans will be in control FOREVER! Start packing losers!